Garrard, the famous London firm of silversmiths and jewelers, was founded in 1735 by George Wickes. He was born into a family of craftsmen and was apprenticed to Samuel Wastell at 14 before gaining his freedom and registering his own maker’s mark in 1722. In 1735 he established his own business in the West End of London on Panton Street and his reputation as a skilled silversmith quickly spread. Within the year he was receiving commissions from aristocratic patrons as well as the firm’s first royal order which was placed by Frederick, Prince of Wales. 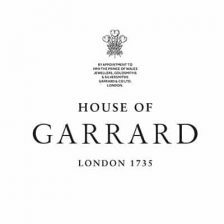 In 1782 Robert Garrard joined the business, originally working with the accounts and stock keeping before becoming a partner in 1792 and eventually taking sole control in 1802 at which point he changed the name to Robert Garrard. He registered his own maker’s mark and over the next sixteen years continued to ensure the firm’s high standards of design and execution. He was succeeded in 1818 by his three sons, Robert Jr., James and Sebastien, and the company became known as known as R. J. & S. Garrard until James’ departure c.1835 when his initial was dropped from the name. In 1843 they were awarded the Royal Warrant by Queen Victoria and succeeded Rundell, Bridge & Co. as Principal Royal Goldsmiths and Jewellers, a position henceforth known as the Crown Jewellers. Their reputation as one of the finest manufacturing jewelers and silversmiths in London was now secure and they would go on to serve six successive monarchs. They exhibited widely and at the 1851 Great Exhibition in Hyde Park showcased almost one hundred beautiful pieces of silver and jewelry. These included a bracelet adorned with water-nymphs transporting a pearl and decorated with emeralds and diamonds, a Gothic style bracelet with chased and enameled angels holding a ruby and pearl, a diamond and pearl tiara, three full gem-set suites and a candelabrum centrepiece in the Moorish style for which they were awarded a £200 prize by the Goldsmith’s Company. The following year they were asked by Prince Albert to re-cut the Koh-i-Noor diamond which had been given to Queen Victoria three years previously. During the 19th and 20th centuries the firm was responsible for some particularly significant Royal commissions including Queen Victoria’s famously small diamond crown, the Girls of Great Britain and Ireland Tiara, the re-setting of St. Edward’s Crown, the Imperial Crown of India and the Fringe Tiara worn by Queen Elizabeth on her wedding day. More recently, of course, they made what is possibly the world’s most famous engagement ring – the Ceylon sapphire and diamond cluster ring worn by Diana Princess of Wales and subsequently by Catherine, Duchess of Cambridge. In 1915 the company was asked to produce the precision rangefinders for the British Artillery in the First World War. In order to facilitate this project, they set up the Garrard Engineering and Manufacturing Company which continued operating until 1992. In later years it became known for building fine quality record turntables which were used by the BBC and in commercial radio stations throughout Europe. In 1952 Garrard amalgamated with The Goldsmiths and Silversmiths Company at which time they moved premises from Albermarle Street (where they had relocated in 1911) to Regent Street. In 1990 they were bought by The Asprey Group who was in turn purchased by Prince Jefri Bolkiah, brother of the Sultan of Brunei. Garrard merged with the jewelry firm Asprey in 1998 to become Asprey & Garrard, moving into new premises on London’s fashionable New Bond Street. The company changed ownership again in 2000 and two years later demerged with Garrard returning to the Albemarle Street site it first occupied in 1911. 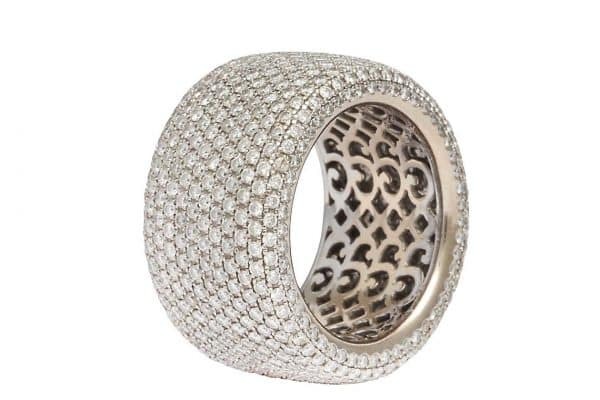 In an effort to re-brand the company, the new owners appointed Jade Jagger as Creative Director a position she was succeeded in by the jeweler Stephen Webster in 2008. However by this point, the company had lost their coveted position of Crown Jewellers, an honor they had held for 164 years by the time it was revoked in 2007.